PAYNE, Edgar Alwin (1883-1947), Missouri-born muralist and landscape painter living in Chicago, who first visited California in 1909. While in San Francisco, he met his future wife, artist Elsie Palmer (1884-1971). Payne visited California again in 1911, and in 1912 he reconnected with Elsie Palmer in Chicago, where she had taken a position as a commercial artist. They married on November 9, 1912. In 1915 the Paynes visited California to see Elsie’s parents in San Francisco and to attend the Panama-Pacific Exposition. They then traveled south and stayed in Santa Barbara for a few weeks. The Paynes moved to California and established a studio in Laguna Beach in 1918. 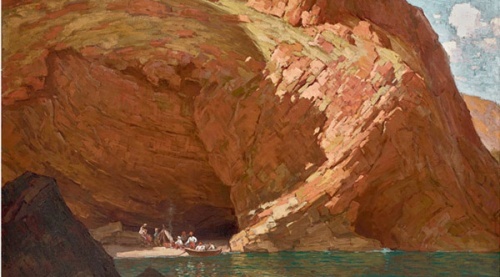 Payne is inter-nationally famous for his canvases depicting Indians riding through desert canyons and landscapes of the Sierra Nevada. 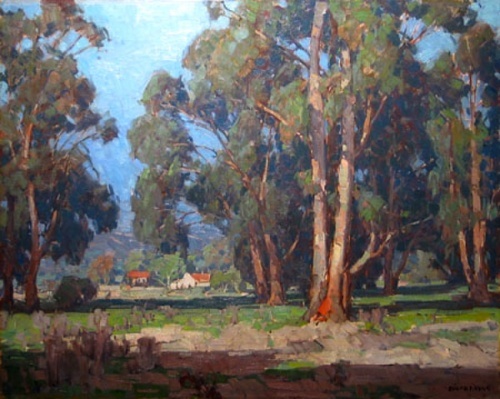 He painted at large oil of a scene at Cueva Valdez, Santa Cruz Island in 1915, and another through the Eucalyptus trees at the Main Ranch. This page was last edited on 7 May 2017, at 10:06.